I decided to pull out an old technique that I haven't used in at least 8 years. Versamark Ink and chalk are the supplies for this technique. It's an easy technique that gives a great affect. I've often said that if I could have only two ink pads I'd choose Archival Black because it's permanent and a Versamark Watermark/Resist Ink Stamp Pad. I'll do another blog on all the joys of this ink pad later. 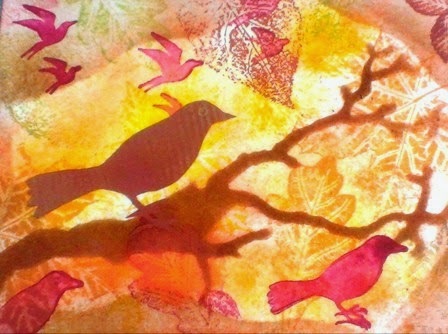 I stamped images using Versamark ink. This ink is clear so you have to watch where you are stamping. Next I used a cotton ball to apply artists chalks over the stamped images. They appear like magic. I used reds, oranges and yellows for the leaves on this page. The chalk gives a nice subtle look to the page. The leaves almost look like they are floating on the page. The only thing you have to be careful about with this technique is to choose colors that blend well together. If I had used a green I would have had to take care not to put it over the orange or I'd have a mud colored page. The chalks I used I purchased at Hobby Lobby over 10 years ago. They are half stick inexpensive artist chalks. I don't draw with chalks to I've never needed expensive chalks. The words are stamped with Archival Vermilion on a piece of a paper napkin that was sitting on my table. 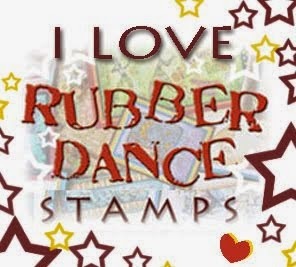 All the stamps are by Rubber Dance. Their nature stamps are fantastic. I love the great veins I get when stamping the leaves. The little flowers are from a set called Weed Love. 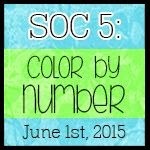 This page in my altered journal is for the color challenge they are having at the Rubber Dance blog. They have me thinking in the fall color scheme. I may have to pull out my pumpkin stamps next!! My, you did step out, didn't you. Not like you to use chalk! But WOW, what a great job. I'm loving' it and think, as I often do, I will have to follow your lead. I'm sure it has been at least that long since I have used my chalks. Did you use a sealer? I'd forgotten all about that technique Boo - it was a fab way to blend all the autumnal tones. Love you page. Thanks, Helen. I forgot how cool that technique was until I used in my book. Very beautiful indeed! Thanks so much for joining our first challenge at Rubber Dance Stamps!